Description - Cushion-Tred mats are our most popular commercial mats designed for use in the kitchen. These rubber mats can be easily rolled up and stored when necessary as well as used as a semi permanent anti fatigue kitchen flooring solution. This multiple kitchen mat system can be affixed together on-site with the use of optional connector strips to form a Commercial kitchen strength large area food service mat. These mats can also use the optional MD ramp system in order to form a beveled edge around the mat. They also help ease foot and leg pain from long periods of standing and provide extra safety by preventing slippage. Size – 2’ x 3’, 3’ x 3’, and 3’ x 5’ sized mats are available. Weight – 19 Lbs. / mat for the 2’ x 3’ kitchen mat, 29 Lbs. / mat for the 3’ x 3’ mat, and 49 Lbs. / mat for the 3’ x 5’ kitchen matting. Recommended Uses –Cushion-Tred mats have been used successfully in a variety of locations. 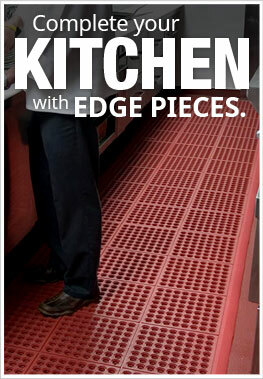 These anti slip rubber kitchen mats have been used successfully as commercial kitchen mats, as home kitchen anti fatigue mats, to provide comfort for food service workers in cafeteria lines and at food service counters, as a non slip mat for use around dish washing stations, behind bars to keep bartenders and glass ware safe, in wet industrial areas, and in restaurant service hallways. Note: Do not use any butyl based solvents / degreasers or oil style cleaners such as Pinesol, Lysol, Murphy’s Oil Soap, WD40, paint thinner, etc. since these types of cleaners will break down the kitchen mats over time.